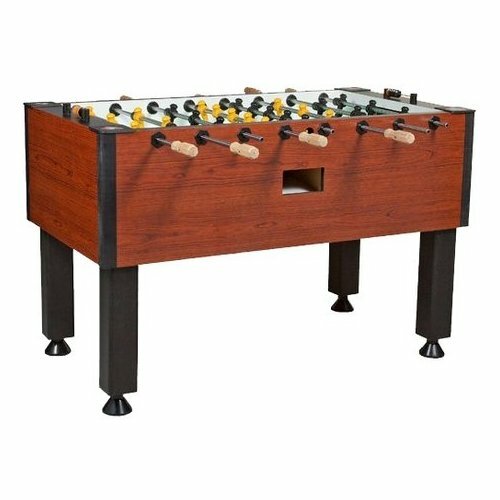 The Dynamo/Tornado Elite Foosball Table is a commercial quality foosball table designed for home use. With all of its impressive features, it will take center stage in your game room. Made of MDF, this beautiful gaming table has a durable exterior laminate with Victorian Cherry finish. Leg pad and down corner construction give the table added stability. The playing field is .75-inch thick with 1.5-inch sidewalls. Adjustable commercial grade leg levelers keep the playing field level, and a dual side ball return keeps the game moving. Precision ground balls provide the smoothest and most accurate play available, while tabletop abacus scorers make keeping score easy.